Featuring sixteen marvellous magical creatures from myth and legend, this is the perfect gift for anyone who has ever longed to ride a unicorn, meet a mermaid, or hear a werewolf's howl! This gorgeous, large-format book is lavishly illustrated throughout, and covers everything from dragons to giants, and elves to trolls. 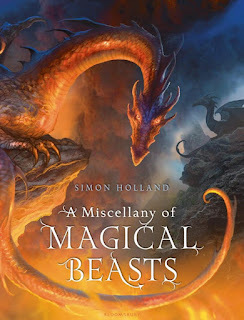 The detailed text gives a thorough overview of that particular magical beast's origins as well as its representation in folklore and mythology around the world. It's fascinating to read how the same beast can have slightly different symbolism or be depicted differently depending on the culture. For example, the phoenix is common to Arabian, Egyptian, African, Greek and Roman mythology. In all, it is connected to ideas of death, rebirth and immortality, but in Egypt it is a dazzling firebird with red and gold feathers. In East Africa is takes on a shape closer to that of a heron or flamingo. While in Greek and Roman legend it's more like a peacock or an eagle. Similarly, the Western unicorn has come to be thought of as a white, horse-like creature with a single horn, difficult to catch and tame. However, the Chinese unicorn (or Ki Lin) has the hooves of a horse but the body of a deer, while the Japanese unicorn (or Kirin) is covered in scales. Harry Potter fans will be able to find out more about Centaurs and the Basilisk too!